It's a stratospheric hit! After a sold-out, one-off concert at the London Palladium, Eugenius! makes its official London premiere at The Other Palace, which blows the trumpet for some cracking new British musicals. Featuring an incredibly catchy score by Ben Adams, of pop-band A1 fame, the production is jam-packed full of geek references, superhero fun and stunning talent. “Don't shoot for the stars, shoot higher” is the motto of the show, as comic-obsessed schoolboy Eugene gets the opportunity of a lifetime to transform his Tough Man strip into a Hollywood film. It's a simple enough story; group of geeks overcome the evil forces around them, with a slightly twee romantic subplot. With shows like The Big Bang Theory entering its eleventh season, geek-genre has exploded into popular culture, and it’s now super-cool to embrace your inner love for comic books. Well, that's what Eugenius! manages to prove anyway, as a strong message of believing in yourself carries the show, accompanied by a score that provides hit after hit. 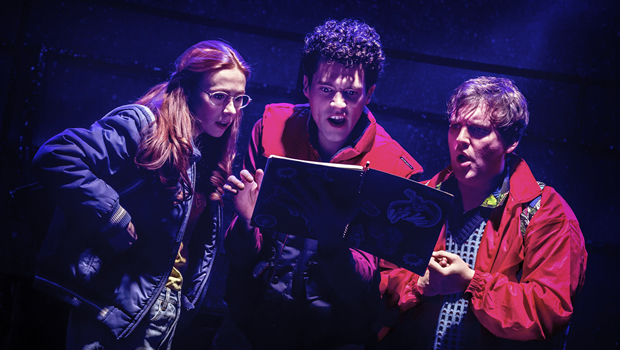 From stand-out solo numbers such as “Who's That Guy?” and “The Future's Bright”, to earworms such as “Comic Book Kind of Love” and “Go Eugenius!”, this is a rare case of a new British musical showcasing music that is hummable on the way home. It helps that the show is packed with outstanding talent. American actor Liam Forde makes a sweet Eugene, whilst Laura Baldwin is a fiercely talented leading lady, whose vocal and comedic performance is bang on-point. It's a strong cast across the board, with most of the laughs coming from Daniel Buckley as girl-obsessed Feris and Ian Hughes as a hilarious Evil Lord Hector, whose fight for villainy is ultimately lost. Whilst Hannah Wolfe's sometimes-tacky costume reminds us that it's not quite a West End-budget show, Aaron Renfree's exciting choreography bounces off The Other Palace's intimate stage, filling the entire auditorium. Ian Talbot's direction ensures that the show moves along swiftly, coming in at a neat 2 hours, with a high-octane, hugely impressive ensemble pulling it all together. It's genuinely refreshing to see a new musical that works so well, in an environment dedicated to giving it the best platform. There's everything you could want; catchy numbers, laugh-out-loud moments and an incredibly talented cast, as well as the potential to grow into something astronomical. And whilst you can argue that Eugenius! is not five-star production value, there’s a lot talent in both the cast and creative team. So it’s true, you already need to see it again!